Recruitment are 217 posts. Candidates have to visit http://sche.ap.gov.in/ASSTPROF/Masters/HOME.aspx website and apply for Assistant Professor Jobs. Last date for the receipt of application is 02-02-2018. Application submission starts from 06-01-2018. Application fee for General/ OBC candidates is Rs. 1000/- and for SC/ ST candidates is Rs. 500/-. Assistant Professor Jobs in Andhra University Recruitment selection will made through Screening test and Interview. Pay Scale for AU Assistant Professor Jobs is Rs. 15,600/- to Rs. 39,100/- plus GP of Rs. 6000/-. 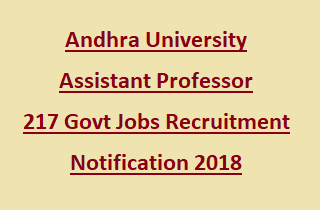 For more details of Andhra University Assistant Professor Jobs Recruitment selection, Application procedure, Application fee details are given below. Total vacancies has been released by Andhra University Recruitment 2018. Total no of vacancies: 217 posts. Post Name: Assistant Professor: 217 posts. 1. Assistant Professor Group I (Arts): 88 posts. 2. Assistant Professor Group II (Science): 78 posts. 3. Assistant Professor Group III (Engineering): 51 posts. Candidate with Master’s Degree qualification in relevant discipline with mini 55% marks from recognized university. For more qualification details see the AU official notification. Pay Scale for Andhra University Assistant Professors is Rs. 15,600/- to Rs. 39,100/- with GP of Rs. 6000/-. Maximum age of the candidate for applying Assistant Professor is 56 years. Andhra University Assistant Professor Jobs Recruitment selection will be based on Screening test and Interview. For detailed selection process see the AU official notification. Eligible applicants have to go through AU official website http://sche.ap.gov.in/ASSTPROF/Masters/HOME.aspx and apply for Assistant Professor Jobs. Upload the relevant documents, Photographs and signature of the candidate along with application form. Starting date to send application form is 06-01-2018. Last date to submit application form 02-02-2018.